Roba Family Farms opens on Farmtastic Friday, September 15, 2017 and will be open every day through Halloween,Tuesday, October 31, 2017. 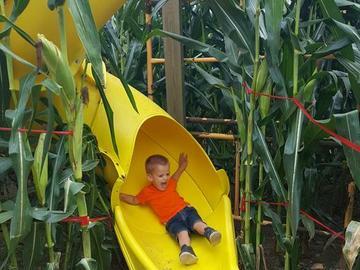 Our farm is open to the public each fall for fireside picnics, adventures in the cornfield maze, lots of treats to eat and delightful animals to meet. Come visit us and have a wagonload of FUN with your friends and family! A September Admission Ticket IS NOT VALID in October without purchasing upgrade. A September Admission Ticket may be upgraded to an October Admission Ticket for $1.00 at the Admission Barn.